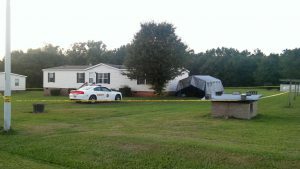 WTSB News has uncovered new details about a shooting last week in Johnston County that critically injured one man. Last Thursday, 59 year-old Joseph Kalvin Aberant allegedly used a rifle, purchased by his wife hours earlier at Walmart, to shoot his daughter’s boyfriend, 36 year-old Alex Ortiz, seven times while inside a home at 60 Waymon Way, off Hood Farm Road, southwest of Clayton. Ortiz underwent emergency surgery after the shooting and remains hospitalized. 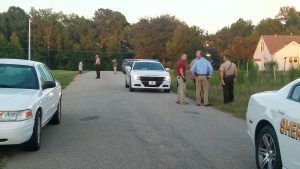 Aberant was arrested near the scene following a brief chase with Johnston County deputies. WTSB News has obtained a copy of a nine page search warrant issued for the address after the shooting. The warrant said that responding deputies located Joseph Aberant attempting to flee in a silver Ford car. After a short chase he was stopped on Little Creek Church Road and taken into custody. Other officers found Alex Ortiz, at 60 Waymon Way, suffering from multiple gunshot wounds. He was rushed by ambulance to Wake Medical Center. According to the search warrant, a detective arrived and began questioning Marie Aberant, the wife of the suspect. Marie said an hour before the shooting she and Joseph sat down with their daughter and Ortiz to discuss “splitting the bills.” Joseph and his daughter had gotten into a physical fight earlier about the rent and at one point were screaming at each other outside the home. Marie told the detective, Alex told Joseph “to bring it outside” and “I’m going to kill him.” When the two men began arguing, Joseph went to a bedroom and retrieved a rifle and placed it on a chair in the kitchen. Alex allegedly began beating on his chest telling Joseph to come outside. Marie Aberant then told the detective, Alex came around a counter and Joseph shot him a number of times. Alex fled outside the home and collapsed. Marie and Joseph Aberant both went to check on Alex. Marie retrieved a towel and placed it under Alex’s head, according to the warrant. Marie Aberant led detectives to a field across the roadway where she had placed the rifle and ammunition. During an additional interview, the warrant alleges Marie Aberant admitted to purchasing the 22 caliber rifle hours before the shooting from Walmart in Clayton. 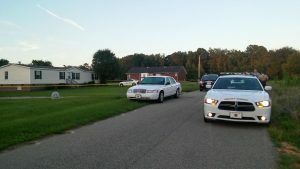 She said her husband purchased the ammunition at another location in Clayton. “Marie said she purchased the rifle for Joseph because she knew he was a convicted felon,” the warrant stated. 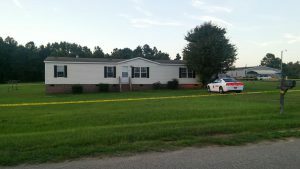 Johnston County Sheriff’s Captain Jeff Caldwell told WTSB News the investigation into the shooting was still ongoing and did not rule out the possibility of more charges. Joseph Aberant remains in the Johnston County Jail under a $1,040,000 bond charged with attempted murder, possession of a firearm by a felon, and fleeing to elude arrest.